It used to be that molting was a huge deal in our house. Toby and Kelly would behave as though they were on death’s door and it would be days of very dramatic budgie behavior. Sleeping for almost 24 hours straight, being fluffed up, wanting to be snuggled when they usually hate to be touched. It was typically a very uneasy time full of trying to make them more comfortable. 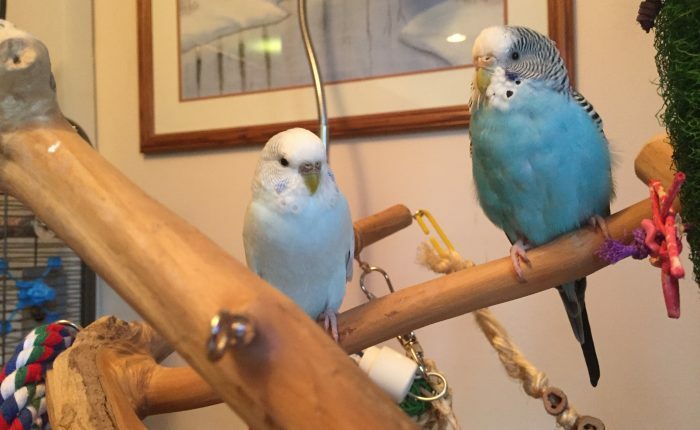 But, now that they have both reached maturity, I’ve made some observations about adult molting budgies. At first it was just Toby who started to handle molting better, although I didn’t notice at the time because I was so focused on Kelly’s discomfort! Then, once Kelly turned one and a few months her next molt was a relative breeze too. I mean, they were still cranky and untouchable and even more inclined to bite than usual (Kelly). But, there was no puffing up, no sleeping all day and no cuddling into mamma for some comfort. I might miss that last bit, but otherwise it’s such a relief not to have the vet on speed dial just because we are laid low by pin feathers! 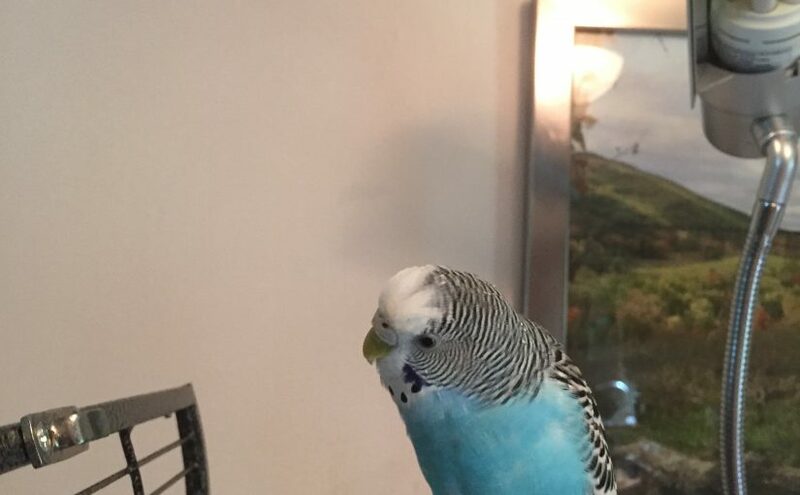 This leads me to believe that once a budgie has gone through a few molts and is a healthy, mature adult they are able to handle the molt a lot better. I have no idea whether it would be because the mature body is heartier or whether it’s just that they aren’t surprised by what’s going on and know that they will make it through okay. Either way, I’m happy that it’s easier for all of us to get through it with some extra baths, misting and maybe some extra millet to lift the spirits. This also provides a possible explanation as to why I see so many folks saying that their budgies always go through a molt like it’s no big deal! I now think there’s a huge difference between juvenile and adult molting budgies. Molting Toby takes a good bath – finally! My flock and I live in upstate New York and we have been having the weirdest weather lately. Right at the end of August it got chilly and we had to turn our heat on for a week. As soon as the temperature dropped Toby and Kelly started on a pretty serious fall molt. Of course, by the time they were out of that molt it was mid-September and the temperature, insanely, was about 90 degrees! So, what else is a girl to do but start molting all over again. Needless to say it’s been a solid couple of months now of feather-covered floors, sneezing humans, and itchy, cranky budgie ladies. I offer them a variety of baths on the regular, especially when they are molting, usually about twice a week. At least 50 percent of the time they completely ignore the bath, and even if they do give it notice sometimes it’s just to run through the water. Kelly will still only take a good soak if I stand right next to her and give her constant encouragement! Regardless of their level of interest I just keep plugging away, offering the baths and then dumping them out. Every weekend we buy a bunch of carrots with the tops still on, or some other type of green that’s good for hanging and make a hanging bath. Well, it’s a good thing we like to eat carrots because lately even that has been a total waste! Finally Toby must have reached the depths of her molting despair and decided that a bath would be just the thing. We constructed the hanging bath and she immediately jumped on it and got the most thorough soaking she has had in months. I tried to get some good pictures but it’s tough when she’s in constant motion and puffed up like a weird broken birdy. So, what’s the point of the post then? I guess it’s just that you have to keep trying. Even when something stops working, like the hanging bath that used to be so reliable for us. Don’t give up, keep offering them the healthy food options and the things they need, and eventually they will take you up on it. I know sometimes it might seem like a waste of your time and resources to have what you give them rejected over and over, but it matters that you do it, so don’t lose heart! Posted on October 3, 2017 September 28, 2017 Categories Our Parakeet StoryTags bath, fun, health, molting, parakeet health2 Comments on Molting Toby takes a good bath – finally! 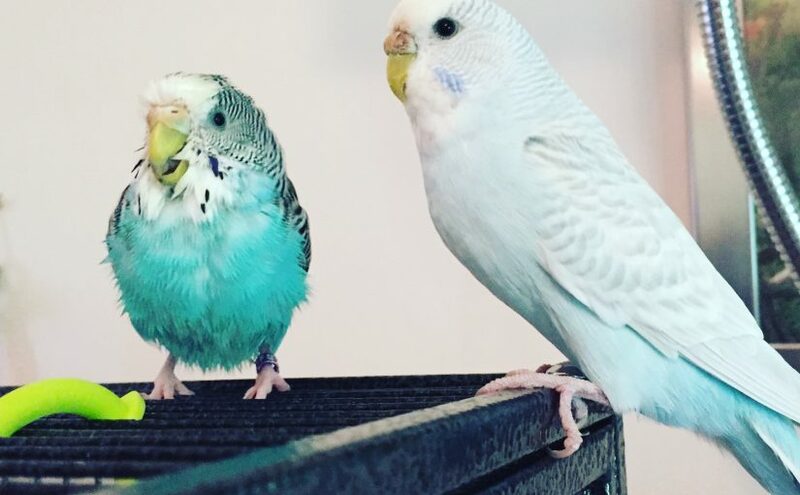 Parakeet poop is one of the easiest ways to keep tabs on your pet’s health and diarrhea in budgies can often be cause for alarm. 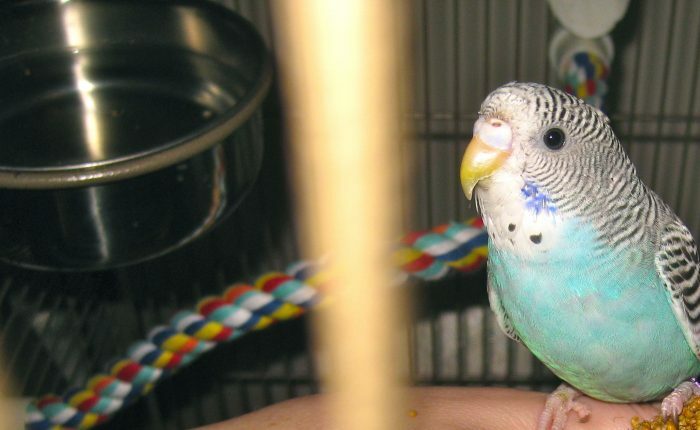 A healthy parakeet poop is not very wet and has well-defined feces and urates. The feces portion is typically green or brown while the urates should be white. Anything that veers from this norm is concerning, but the wet, loose poops or diarrhea are frequently transient in nature and in many cases, can be explained by the following causes. Fear based wet poops. 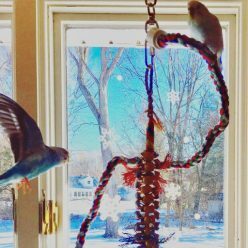 This is typically seen in parakeets that are new to your home and feeling very anxious. When they are afraid they can have very loose poop that sometimes has no urates at all and is just a small amount of feces and urine. We still see this with Kelly, she has a very nervous temperament and if we startle her coming into the house or wake her abruptly from a nap she will immediately display “fear poops”. These should resolve either when the parakeet has gotten over being startled or whenever they feel comfortable. With a newly brought home parakeet this can last some time, make sure they are eating and drinking and don’t have other outward signs of illness such as fluffing up, tail bobbing etc. Post-bath poops that are completely liquid. When a budgie takes a bath they frequently ingest a lot more water than would be typical for them. This can result in waste that is completely water. This should be relatively short-lived. Side note – it always reminds me of the Baby Alive Doll that I used to have where you would feed her the bottle of water and the liquid would just run straight through her! Eating fruits or vegetables. Fruits and vegetables have a very high water content compared to seeds. Eating a big helping of wet lettuce or watermelon would naturally cause loose poop or diarrhea for the time that it is being processed. Molting. Not every budgie has loose poop when they are molting, but it is a relatively common side effect. In our house it’s intermittent for a few days while they are at the most wretched heights of pin feathers. As long as they are eating and drinking I try not to overwhelm myself with worry! Competitive drinking. I can’t say that this is common among all budgies, but mine have an intense flock mentality. If one of them eats the other one has to as well, even when they are in separate cages. So, sometimes one of them goes to have a drink, and then the other one does, and they end up in this feedback loop where they just keep drinking because the other one is drinking. This can be a very specific cause of short-term diarrhea. The theme with all of these causes is probably readily apparent. You should be able to define the root cause relatively easily based on what your budgie has just been doing or eating. The diarrhea itself ought to be short lived, except in the case of fear, which can take a bit longer to resolve in a newly acquired budgie or molting, as that can be intermittent over a period of time. Trust your gut and keep an eye out for any other symptoms. There are many instances in which diarrhea warrants a call to your vet. Once you know your budgie it will be easy to tell what’s “normal” for them and what’s cause for immediate concern. 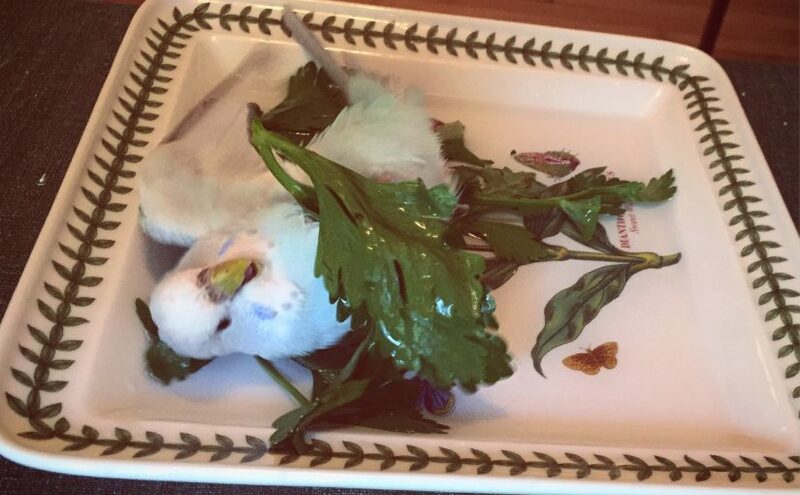 Please note – I am neither a vet nor a medical expert about parakeets. If you are concerned about your pet’s well-being please call your vet and make an appointment. This post should not substitute medical care for your pet and I am not making any specific recommendations of care. Posted on October 4, 2016 April 12, 2017 Categories Budgie Tips and Tricks, Our Parakeet StoryTags basics, molting, parakeet, sick2 Comments on Does molting make a parakeet sick?